With six straight division titles under their belt, the Los Angeles Dodgers have their sights set on finally winning a World Series 30 years after their last world championship. Standing in their way, at least during the NLDS, will be the Atlanta Braves. Despite modest expectations heading into the season, the upstart Braves won the NL East and now pose a threat in the National League playoffs. As the highest-scoring team in the National League this year, the Dodgers have a clear advantage in this department. Nearly every hitter in the Los Angeles lineup had an OPS over .800 this season. The Dodgers also have seven hitters with over 20 home runs this year, and that doesn’t include Justin Turner, who missed the first part of the season due to injury, or Manny Machado, who hit 13 home runs after being traded to the Dodgers mid-season. Bottom line, there are no easy outs when facing the Los Angeles lineup. Of course, the Braves should not be overlooked for their offensive prowess. They have veteran Freddie Freeman to anchor the lineup with the dynamic duo of Ozzie Albies and Ronald Acuna Jr. serving as the table setters. Atlanta actually had the second-highest OPS in the National League against left-handed pitching this year, which means they should match up well against the Los Angeles lefty-heavy rotation. The Dodgers had, by far, the best rotation in the National League this season. Hyun-Jin Ryu was so good, he’ll actually start Game 1 over Clayton Kershaw. In 15 starts this year, Ryu posted a 1.97 ERA. Behind him, the Dodgers will throw Kershaw, Walker Buehler, and Rich Hill. The rotation can go even deeper with Alex Wood, Ross Stripling, and Kenta Maeda. As mentioned, it’s lefty-heavy, but with Ryu and Kershaw likely to start two games each over five games, it’ll be tough for the Braves to measure up. The Braves will go with Mike Foltynewicz to lead their postseason rotation alongside veterans Kevin Gausman and Anibal Sanchez. Foltynewicz won 13 games with a 2.85 ERA this year, so he’s someone the Braves can trust. Meanwhile, Sanchez and Gausman would have been shocking to see in the postseason at the start of the year. However, both have been rejuvenated since coming to Atlanta. However, the Braves are still undecided on whether it’ll be Julio Teheran or young left Sean Newcomb to get the call in Game 4, indicating that they don’t have nearly as much depth as the Dodgers. Neither team has a dominant bullpen, but the Dodgers are a little closer. Kenley Jansen appears to have bounced back from his stint on the DL with an irregular heartbeat. He had a strong September and can sometimes get more than three outs if needed. Having starters like Maeda and Wood in the bullpen will help their depth. The Dodgers also have a few unsung heroes like Pedro Baez and Scott Alexander who will be relied on to get big outs at some point. The Braves also have a reliable closer in Arodys Vizcaino, as well as some young setup men like Chad Sobotka and A.J. Minter. That trio will be crucial to Atlanta’s bullpen success, as will be veteran Johnny Venters, who brings some playoff experience to the table. However, beyond that group, the Braves may need some starters like Max Fried or possibly Teheran to provide some bullpen help. Clearly, the Braves are fighting an uphill battle in this game, at least on paper. 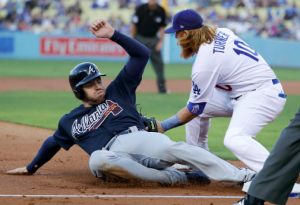 However, the Braves have plenty of speed and athleticism that could give Los Angeles some trouble. Atlanta is too good not to get at least one win in this series. However, the Dodgers will eventually put their foot down and return to the NLCS. Los Angeles wins in four games.